As part of the Lectrosonics Venue System, the VRS Standard Receiver Module installs into the Venue Receiver Master (VRM) unit and provides 256 UHF selectable frequencies. In addition, the VRS receiver module features Smart Diversity (phase-diversity) reception for minimal RF interference, noise and drop-out. A total of 6 VRS modules can be installed into a single VRM master, enabling simultaneous operation of up to 6 microphone transmitters. 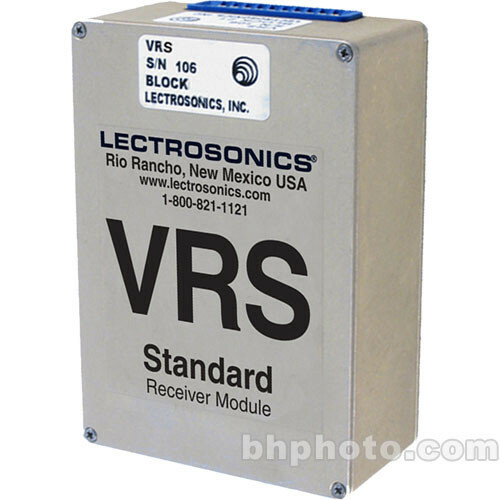 The VRS venue receiver standard features 256 selectable UHF frequencies. Frequencies are selected via VRM receiver master. The VRS modules feature smart diversity reception. Antenna phase switching minimizes drop out and RF interference. 24-bit digital audio stream is decoded at the receiver resulting in greater operating range without noise and artifacts caused by analog compandor circuits. Digital Hybrid operation also allows for backward compatibility with older analog Lectrosonic transmitters as well as later Digital Hybrid compatible models. Box Dimensions (LxWxH) 9.9 x 8.1 x 3.0"